Retail sales increased for the third consecutive month in March, rising 0.6% to $50.2 billion. Higher sales at motor vehicle and parts dealers more than offset lower sales at food and beverage stores and gasoline stations. Sales were up in 6 of 11 subsectors, representing 53% of retail trade. Excluding sales at motor vehicle and parts dealers, retail sales were down 0.2% in March. After removing the effects of price changes, retail sales in volume terms increased 0.8%. Following a 2.0% increase in sales in February, motor vehicle and parts dealers (+3.0%) were again the largest contributor in dollar terms to the increase in March. New car dealers (+3.3%) accounted for the majority of the gain, although all store types in this subsector reported increases. Clothing and clothing accessories stores (+2.5%) posted higher sales in March, following a decrease in February. For the first time since November 2017, sales increased at all store types in this subsector. Receipts at general merchandise stores (+1.0%) rose for the fifth time in six months. Sales at food and beverage stores (-1.2%) declined for the third consecutive month, largely due to lower sales at supermarkets and other grocery stores. Gasoline stations (-1.9%) posted a decline for the second month in a row. Sales at gasoline stations in volume terms decreased 2.5% amidst higher gasoline prices. Higher sales were reported in seven provinces, accounting for 93% of retail trade. 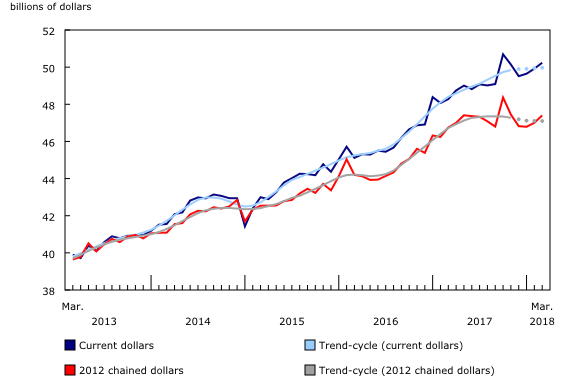 Quebec (+1.3%) and Ontario (+0.6%) were the main contributors to the increase in dollar terms. The census metropolitan areas (CMAs) of Toronto (+1.0%) and Montréal (+2.1%) both posted gains. After three consecutive monthly declines, sales in Manitoba rose 3.2% in March, largely on the strength of higher sales at new car dealers. Sales in British Columbia increased 0.6%. In the Vancouver CMA (+2.4%), retail sales grew for the first time since October 2017. On an unadjusted basis, retail e-commerce sales totalled $1.3 billion, representing 2.6% of total retail trade. On a year-over-year basis, retail e-commerce increased 11.1%, while total unadjusted retail sales rose 3.4%. Real-time CANSIM tables 080-8020 and 080-8027 will be updated on May 28. For more information, consult the document Real-time CANSIM tables. Data on retail trade for April will be released on June 22.